Joy! Love! Peace! Believe! Christmas! Couple of more Christmas cards to share with you all today. Can’t have enough of Christmas cards I guess. I need more and more everyday. 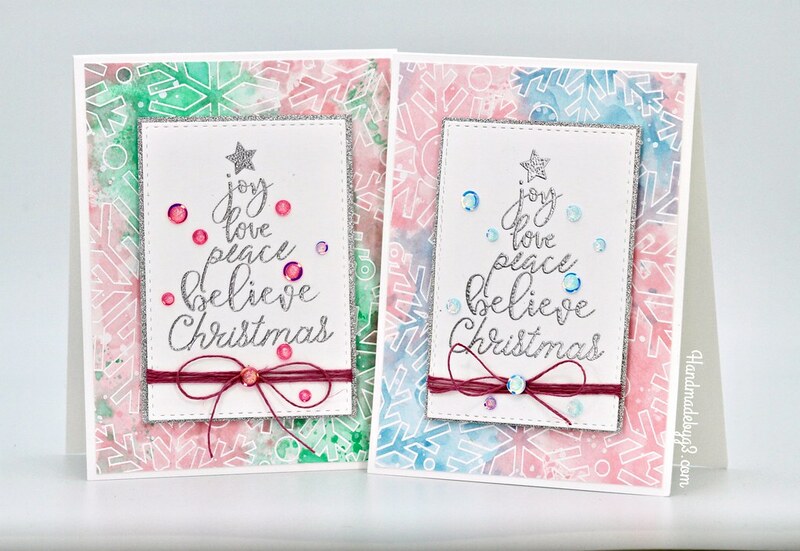 These ones I made earlier this month using Simon Says Stamp Fun and Festive collection stamp sets. Welcome back to my blog and hope you are enjoying my projects on my blog. I have couple of more Christmas cards in non traditional colours. 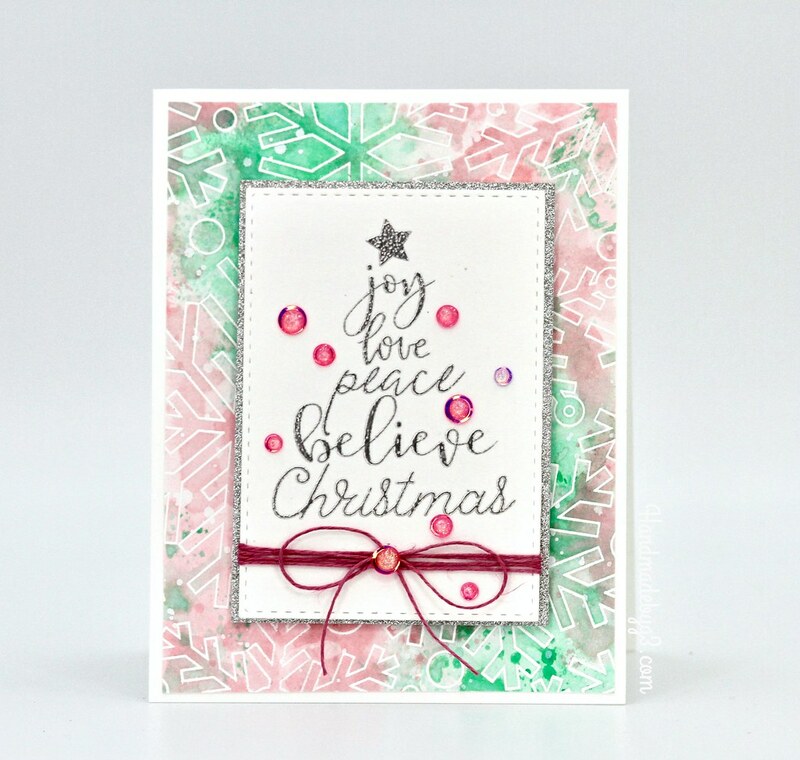 Non traditional colours have always been my go to especially with Christmas cards. I think they bring a sweet surprise factor when the recipient opens the envelope. Anyway, here are the two cards for you. 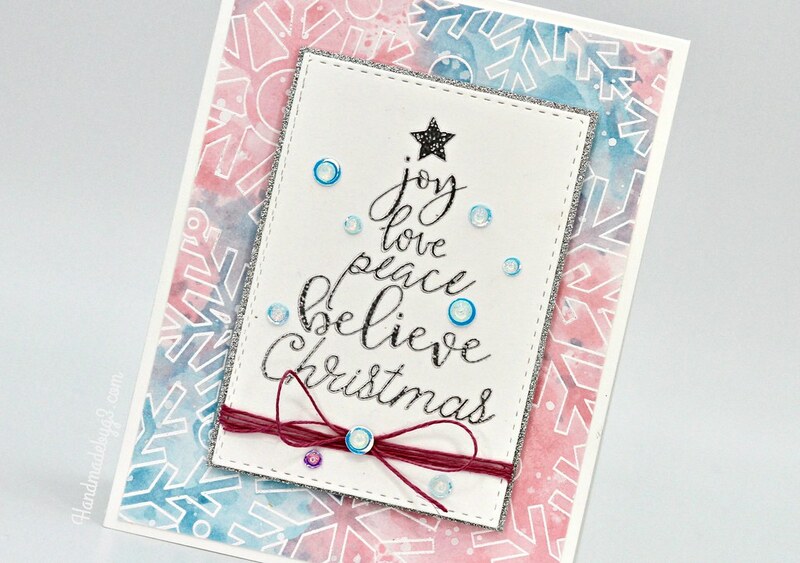 On both the cards, I used the new Outline Snowflakes background stamp and the Christmas Wishes stamp set. 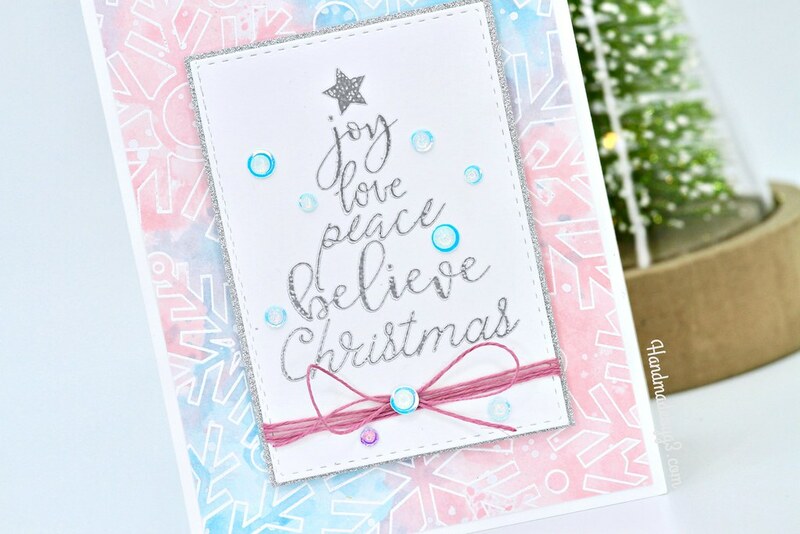 They both are from Simon Says Stamp’s Fun and Festive collection. 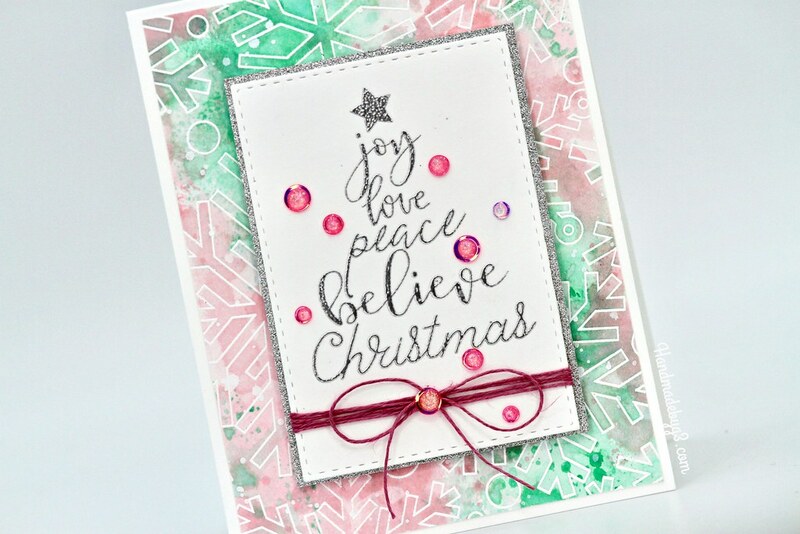 On both the backgrounds, I used Spun Sugar distress inks. But added Salty Ocean on one panel while the other had Cracked Pistachio distress ink to bring out the outline snowflakes using emboss resist technique. I trimmed the panels and adhered on white card base to have a white border around the panel. For the focal sentiment panel I silver heat embossed the sentiment from Christmas Wishes stamp set on a white stitched panel, matted the panel with silver glitter cardstock, wrapped the pink twine around the bottom to make a bow before adhered on the middle of the background panel using foam adhesive. I embellished the card front using Simon’s Birthday Cake sequins. Simple and pleasing to the eye I think. Below are the photos of the two cards individually along with the closeups. 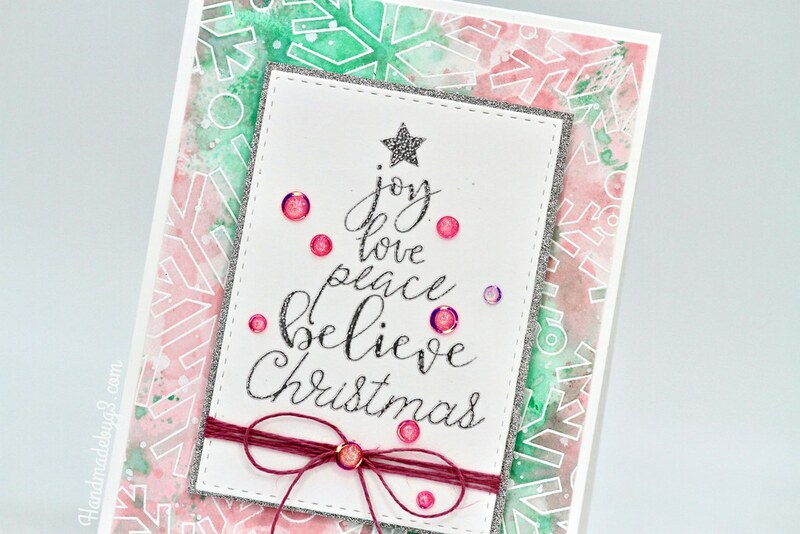 I love love the Outline Snowflakes background stamp. Just so pretty. There are many inspirations on the gallery using this stamp. Make sure you check them out. Thank you for stopping by here again! Enjoy your day! 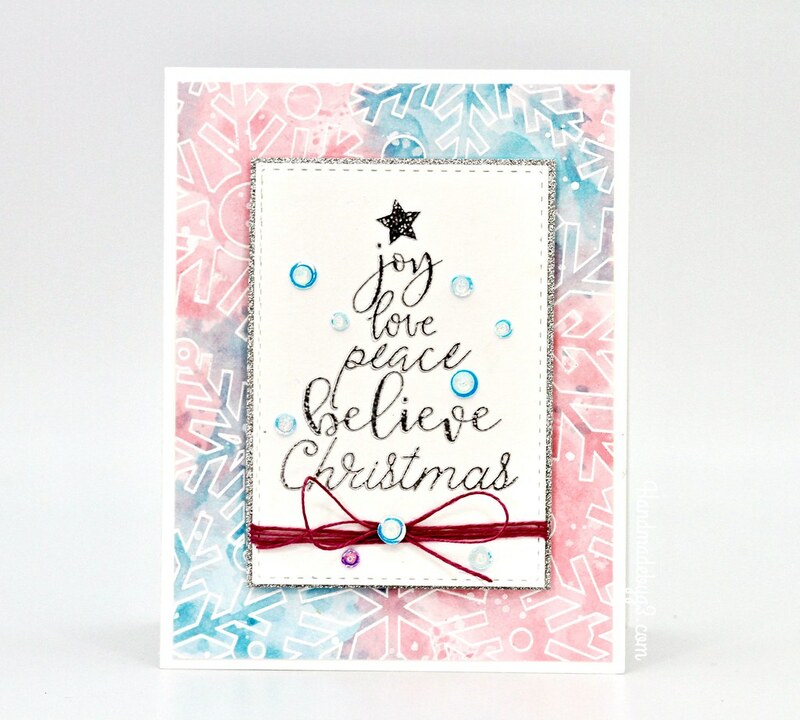 Such fun and festive cards, Gayatri!